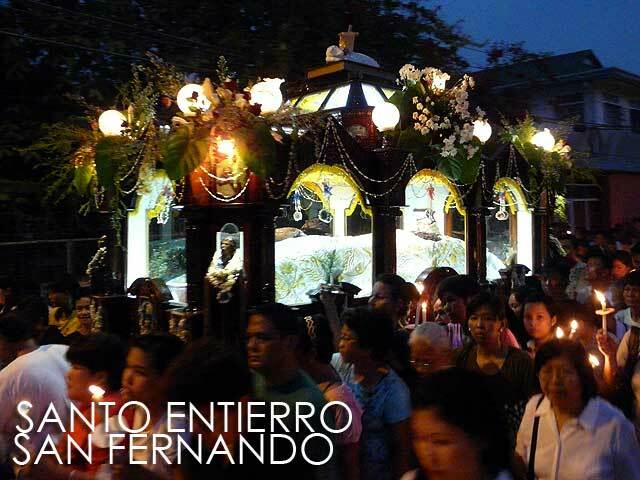 Every Good Friday, the Santo Entierro or Apung Mamacalulu are brought out in grand carrozas called calandras for the Good Friday procession. 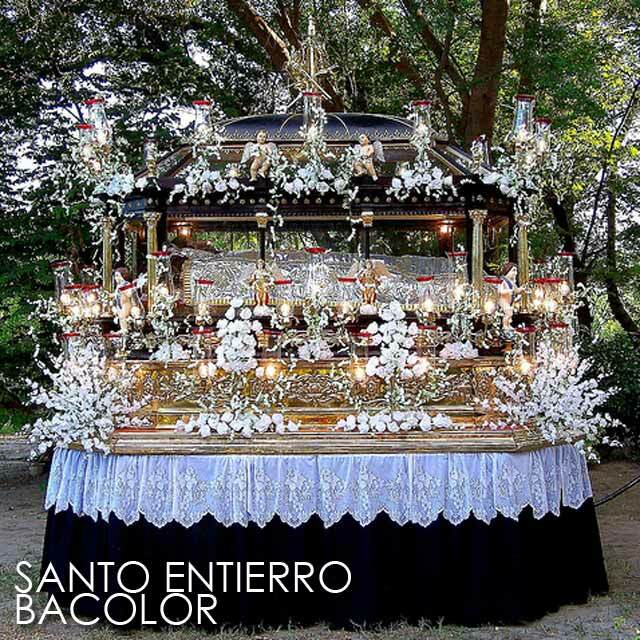 Here are photos of some of the Santo Entierro carrozas or calandras of Pampanga. It's a work in progress so I'll be adding photos and descriptions as I receive them. Thanks to the Center for Kapampangan Studies for providing some of the photos including this one of the Guagua carroza being prepared for the Good Friday procession. ANGELES: Alex Castro shares that Angeles has its own Apung Mamacalulu or Santo Entierro owned by the Dayrit clan. This image figured in a controversial 1929 Good Friday procession that ended in its kidnapping. It took a Supreme Court decision to resolve the issue of its ownership. ARAYAT: According to Toto Gonzalez, the Arayat Good Friday procession is lovely and beguiling with antique candlelit carrozas and old, archaic-sounding Kapampangan religious music. A burol or wake for the Santo Entierro commences after the procession at the Spanish colonial era chapel of the Medina-Samia-Santos family a few meters from the church. This last until 11:30 p.m.
BACOLOR: The Bacolor Santo Entierro is owned by the Joven-de Leon clan. It most probably had belonged to Don Juan Joven and Dona Geronima Suares. It was buried by lahar in 1995 and was dug up the same year. It was kept until 2004 when it was restored by Tom Joven who is now the caretaker of the image. 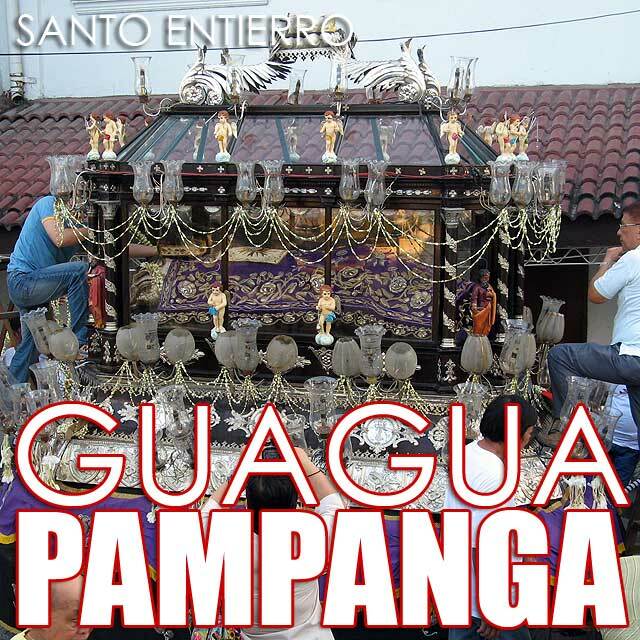 GUAGUA: The Guagua Santo Entierro in the main photo is owned by the Infante-Velez clan. MABALACAT: The Apung Mamacalulu of Mabalacat has its own chapel beside the Mabalacat Elementary School. It is believed that the image originated from Mexico. 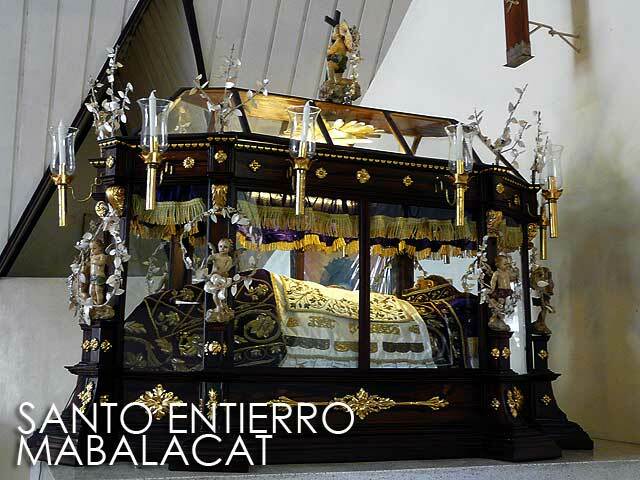 It belonged to Doña Vicenta Dizon who was married to Don Juan Rivera. The couple were childless so the calandra was passed on to the Rivera-Serrano family. Preparing the image for the procession is a community affair, done during the morning of Holy Thursday. The carroza is ornamented by mother of pearl flowers and silver symbols of the passion of Christ. SAN FERNANDO: Above is the Santo Entierro of San Fernando. This is a fairly recent postwar calandra. 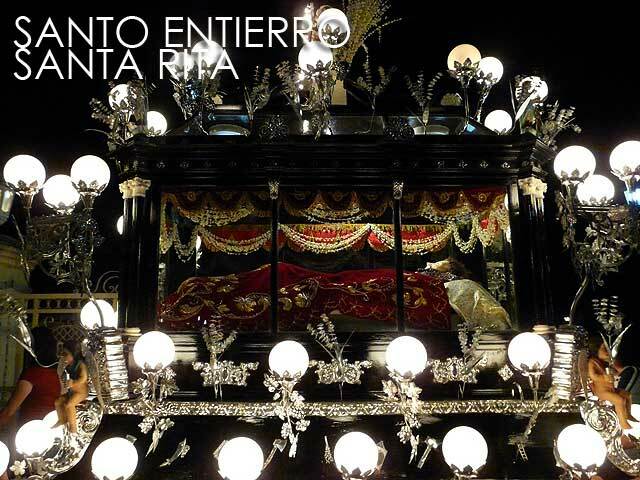 SANTA RITA: The Santa Rita Santo Entierro is owned by the Miranda-Maglalang clan. 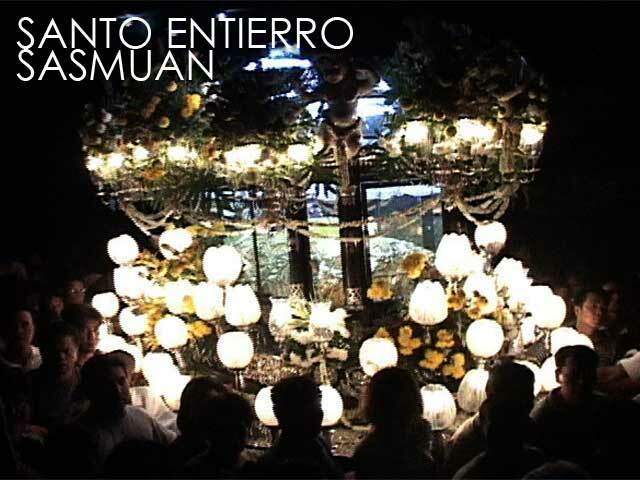 SASMUAN: The Sasmuan Santo Entierro is owned by the Mercado family. According to Toto Gonzalez, the five most beautiful calandras of the Santo Entierro in Pampanga are Santa Rita (Miranda-Maglalang), Arayat (Medina-Samia-Santos), Sasmuan (Mercado), Guagua (Infante-Velez), and in recent years, with all the improvements made by the formidable Tom Joven, that of Bacolor (Joven-de Leon). He adds that also beautiful, although simple, are the mid-1800s calandras of San Luis, Minalin, Santa Ana, Mexico, Mabalacat, Candaba, and Apalit. Those of Lubao, Magalang, Angeles date back to the turn of the 20th century. The calandras of San Fernando and Macabebe are fairly recent. He hasn't seen those of Masantol, Porac, and Floridablanca though and we look forward to his reviews. 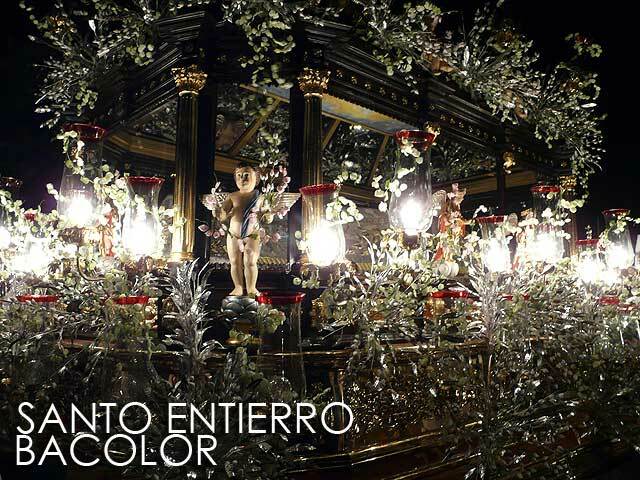 While many of the calandras date from the 1800s, many of the images of the Santo Entierro are from the 1700s. Toto further notes that the only existing calandras in other provinces that can compare with those of Pampanga are: Vigan, Ilocos Sur; Lingayen, Pangasinan; Baliuag, Malolos and Barasoain, Bulacan; San Pablo (originally from Santa Cruz, Manila), Binan, Pila, Paete, and Pakil, Laguna; Lipa, Batangas; Carcar, Cebu; Molo, Iloilo City; Bacolod and Talisay, Negros Occidental and Mambajao, Camiguin. If you have photos or stories of other Santo Entierro carrozas in Pampanga, please feel free to share them at info@ivanhenares.com. I loved your articles on the Santo Entierro in Pampanga. Next you should go to Binan where our family- the Yaptinchay, Yatco, Gana and Mercado-Rizal clans originate. Sort of, because I think they all came from China and Spain, como tu. 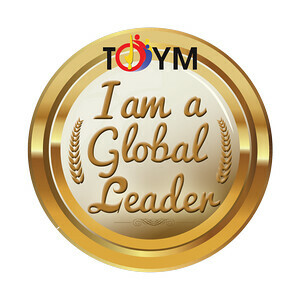 Am still touring the world. Currently watching all the operas, ballets, plays, in beautiful, ever-progressive, wonderful San Fran. Truly enchanting place. Come on over and bring my sis Babyling, who celebrates her 75 today, and her retiring son Joey to you, Joe Rico to our family.